The above words, taken from ancient Chinese literature could be translated as; A great hermit hides at the Court or at the market, while an inferior hermit hides in the mountains or in the fields. While an inferior Zen master separates himself from the real world, a truely great Zen master lives among ordinary people and yet is not influenced by fame and wealth. Hi, I am a wood-fire potter, living and working in the Japanese tradition in Tring, Hertfordshire (UK). Following mediaeval potter's wisdom, I design and build simple wood-fired kilns called 'anagama' for long period of firing and 'raku-gama' for quick (glazed tea bowl) firing. My anagama firing usually takes 9 - 10 days. 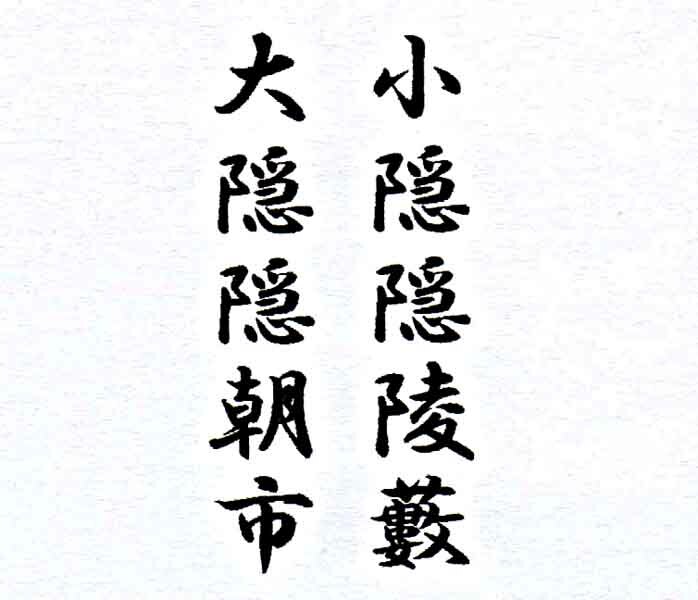 This entry was posted in zen wisdom and tagged calligraphy, zen wisdom. Bookmark the permalink.